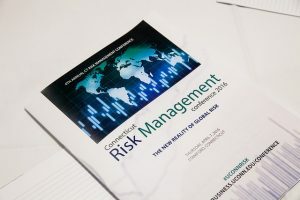 Thank you for your interest in the Connecticut Risk Management Conference. The 2016 conference, "The New Reality of Global Risk" featured sessions on emerging risks and trends, enterprise risk management, geo-political and social risks and cyber risk all with a global perspective. Next year's conference will be held on Wednesday, April 5th, 2017 in Stamford, CT.
For information regarding participation, sponsorship or agenda topics for the 5th Annual Connecticut Risk Management Conference please contact Jose Aponte. The conference included six (6) sessions on various topics about global risk. Interested in sponsoring the 2017 conference? Please write to Chinmoy Ghosh.